The Boston Red Sox slugger headed for the All-Star Game says intensive studying of batting practice footage on the iPad makes him "a trained hitter." Every batting practice session that J.D. Martinez takes is filmed by two iPads mounted on either side of the batting cage. Then, when Martinez steps up, he brings his own personal iPad to the mix. Red Sox video coordinator Billy Broadbent aims Martinez's iPad at the batter's box and later the player studies the footage on it. 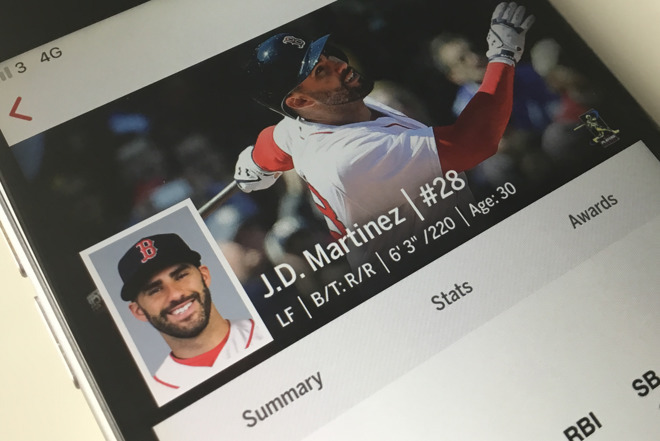 MLB.com says that Martinez has risen from "castoff" to "the best hitter in baseball" since he started using the iPads, but he's arrived there through diligent study in conjunction with the devices. Martinez specifically notes the mechanics of his swing and says that he minutely examines playback footage showing multiple images side by side to cover all angles. "It makes me who I am. I have to grind away to get out of the bad habits," Martinez said to the Associated Press by way of Boston.com. "I have to stay on top of it because my body will find a way to let 10 million swings I've taken when I was a kid slowly come back in." "I always tell everybody that I'm not a natural hitter. I'm a trained hitter," he added. His process has not always been welcomed by his teammates. He first tried it in 2014 when he was with Detroit, but the Tigers players and staff ribbed him for it and he stopped. "In  I was too scared to do it because I was too young, and it was an older team," says Martinez. "In , I had more confidence." The raw stats make it clear his approach works. In 2014 he had 23 home runs compared to 38 in 2015 and this year 29. Over the same time, his batting average went from 2014's .315 to .282 the next year. At the end of the first half of the 2018 campaign, Martinez's average stands at .328 with 29 homers. Martinez is currently third in batting average, plus first in home runs and runs batted in in the American League.